Everything in the online store’s on sale! This time of year can sometimes feel a little dull. Spice it up with something new for yourself. If Valentine’s Day is your thing you can get a really sweet something for a really sweet price! Just enter “BEMINE” in the discount code slot at checkout and SAVE 30% on your entire order from now until midnight on February 14th. 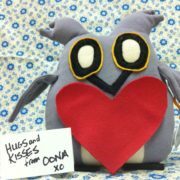 Come by the Oona table at the Wise Hall Flea Night Market December 23! I’ll have lots of good deals on tons of great stuff including underpants and fun accessories! There will be nog and live music so sip while you bop and shop! IT’S CULTURE CRAWL TIME AGAIN! The 20th Annual Eastside Culture Crawl starts tonight! 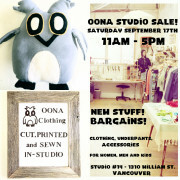 Oona also got a sweet mention in the Vancouver Sun! I’m having a studio sale! Stuff for women! Stuff for men! Stuff for kids! Fun accessories! BARGAINS!!! 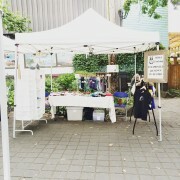 Artful Sundays Was a Neighbourhood Blast! 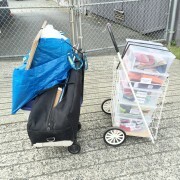 I carted my stuff up the hill from the Oona studio to the Britannia Community Causeway and set up the Oona tent for my first ever Artful Sunday this past weekend. It turned out to be an amazing day! I met so many neighbours officially for the first time – some of whose children I’ve seen grow up from afar over the fifteen years I’ve lived and worked on Commercial Drive. I saw so many familiar faces, some of whom saw that I was going to be there and came specifically to see me and to some that it was a delightful surprise. I even acquired the nickname “East Van Undies”. My heart swells and I’m so pleased to have been a part of such a great event! 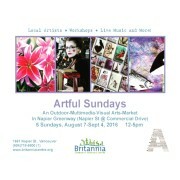 Artful Sundays are every Sunday until Labour Day weekend. Come see me in the Oona tent again on Sunday September 4! SIGN UP NOW TO GET THE CURRENT RATES! 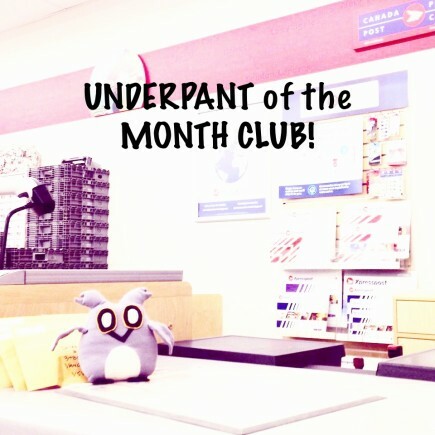 It’s been 10 years of the UNDERPANT OF THE MONTH CLUB – the best club ever! – and the prices have never changed. Due to the rise in mailing costs, September 1st 2016 will see the first price increase for all memberships. If you’d like to defer the start date until the holidays please let me know. I’ve got a new print and I’m putting it on all sorts of stuff! It’s a taco and it’s fantastic. Sound the trumpets, they’re finally here! Men’s Frankenpants are available at last! One of a kind brief-style underwear made from bits too small for a whole pair of another style. The colour combination of fabrics and the print on the front will always be a surprise if you order these ones since I make them out of what’s left in the studio from ot her production runs. I make these for the fun-loving and the landfill loathers! One of a kind brief-style underwear made from bits too small for a whole pair of another style. The colour combination of fabrics and the print on the front will always be a surprise if you order these ones since I make them out of what’s left in the studio from other production runs. I’ve gone through the bin of small bits – it’s been a while – and cut them up into Frankenpants. These are one of a kind underpants made from pieces of fabric leftover after production runs. My heart feels better and my sleep is more restful when I’ve used every bit possible and can prevent more from going to the landfill. I got more than 100 pairs out of this lot of scraps!